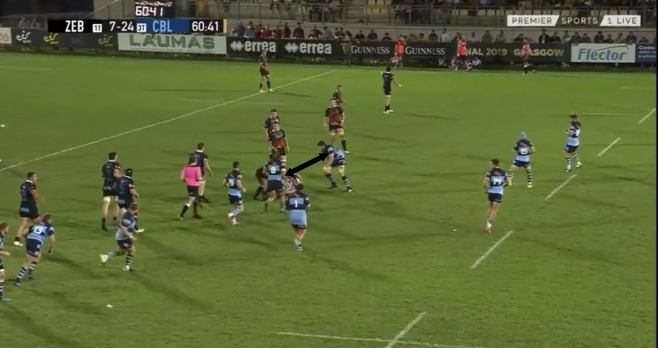 Saturday’s 24-26 defeat to Zebre was disappointing for a whole host of reasons if you’re a Cardiff Blues supporter. The hope that was raised and then taken away, losing the lead inside the last five minutes once again, still being without a win this season, a misfiring lineout and then onto this week’s analysis features, the stunted attack and the struggling defence. We start with an offence that from 76 carries barely mustered two metres per carry, beat just 12 defenders, made only five offloads and could only manufacture three line breaks in 80 minutes. When you consider we scored 21 of our 24 points in the first 10 minutes, the following 70 minutes were well below par. Now, obviously the backs are, with the exception of Jason Harries who has slotted in superbly since arriving this summer, exactly the same as those who were almost unstoppable in the second half of last season, so what has changed since John Mulvihill and Jason Strange arrived? Having soldiered through watching the game back a few times I’ve nailed it down to the use of our forwards in attacking phase play. Last season we were really well drilled in when we were carrying, who was carrying the ball and what the bigger picture of the attack was because, as much as the forwards maybe won’t want to hear this, when they’re trucking the ball up the aim is not for them to be scoring tries. Instead they are providing the platform for your best players, in our case the likes of Gareth Anscombe, Rey Lee-Lo, Owen Lane and Matthew Morgan, who have the ability to unlock a defence with a bit of go-forward ball. Josh Navidi and Dmitri Arhip are the players who are carrying, no problem with that, but with Anscombe, Lee-Lo and Garyn Smith in the ruck and Owen Lane just behind it in the first clip, and play right to the touchline in the second clip, there’s little reason to throw the ball wide on these phases. 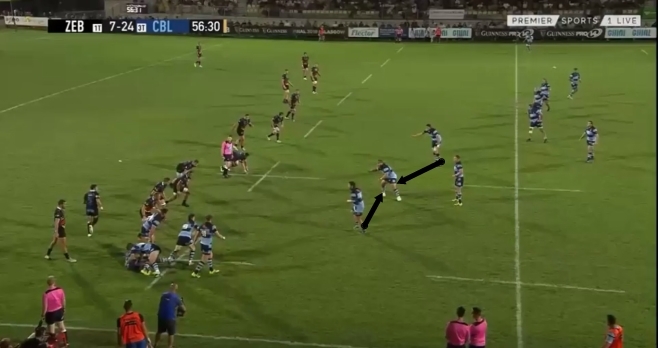 What is needed is two distinct carrying pods off Tomos Williams to take up a phase or two before the backs are re-organised, with the supporting players a lot closer to the ball carrier to ensure ball security. 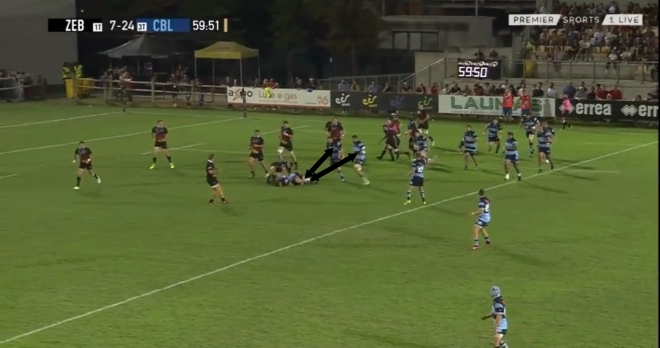 A latch player on to Navidi or Arhip to assist in the contact and prevent a Zebre jackal. It’s that point about ball security which is the real issue, in that we didn’t support the ball carrier properly at the majority of breakdowns. 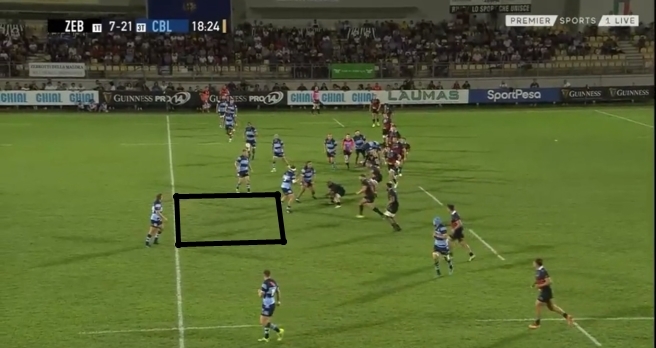 The platform that the forwards need to lay on has to be one that ends with quick ball, and at the very minimum needs to be one that results in Cardiff Blues retaining possession. Unfortunately, too often on Saturday night we found ourselves fighting to keep hold of the ball and losing momentum to a Zebre side not renowned for their work over the ball but who found it far too easy to jackal at the ruck while they waited for the Cardiff Blues support players to arrive. If you operate with a latch on the ball carrier, or at least a carrying pod with a support player or two nearby, the ball comes back every time and a lot quicker than it did in Italy. 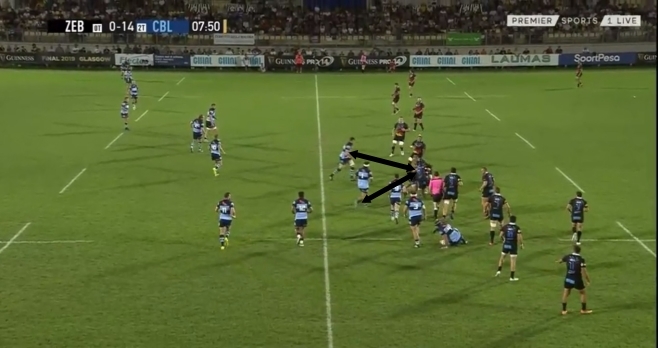 I can’t talk about the Cardiff Blues attacking game at the moment without mentioning the pop pass. If you leave the player who receives the pop pass completely unsupported though, you negate any of the positives the move can bring. The likelihood is that the player making the pass is going to get hit as it happens just before contact, so you need at least another player one out from the eventual ball carrier to support at the breakdown. On the subject of the breakdown, the accuracy of our subsequent clearout could be better which, along with improved presentation of the ball, will all help to improve our ruck speed and secure quick ball. There are issues to fix behind the breakdown and set piece as well, it’s not entirely an issue of how we’re using the forwards in attack. We’re not getting Gareth Anscombe on the ball enough at first receiver, and there’s a worrying stat from Saturday that sees the centres and back three making a combined 10 passes between them in the 80 minutes. 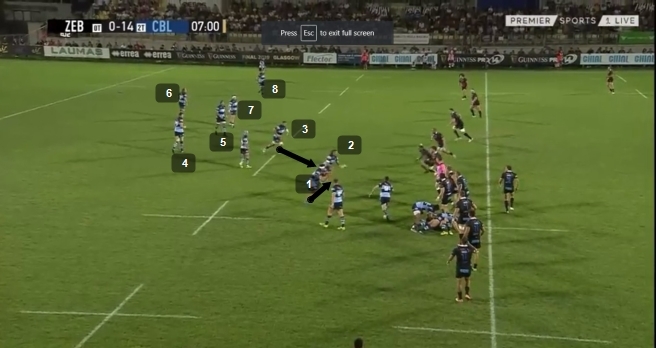 When you consider that two of our three tries on Saturday, and two of our four tries against Leinster, came from first phase attacking ball of a set piece, it is a sign of how quickly our attacking confidence dipped against Zebre that our play became so negative. 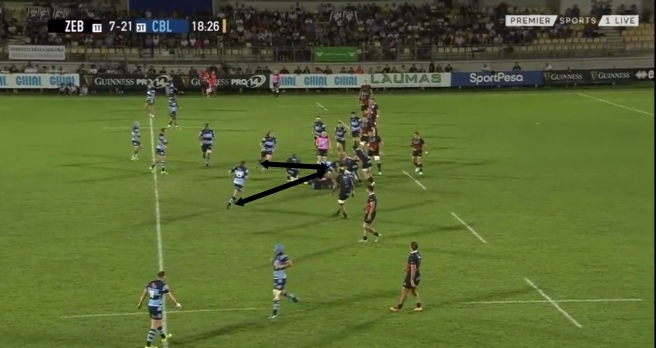 Bringing centres who, in Garyn Smith and Rey Lee-Lo, aren’t close to a Jamie Roberts in the crash ball centre stakes on a short line is not the Cardiff Blues of last season, or even the first 10 minutes in Parma. We look so much more dangerous when Anscombe has his hands on the ball and is putting people through gaps outside him. The good news for supporters ahead of the game against Munster on Friday is that for one fleeting moment towards the end of match against Zebre, everything seemed to click in attack. Josh Turnbull carries the ball with Olly Robinson as the latch, quick ball is secured and well presented as Lloyd Williams gets possession to Gareth Anscombe who comes very close to putting Harri Millard through a hole, with at least front foot ball secured. All my attacking dreams come true! I’ve no doubt that we have enough quality to break out of this attacking dry rot outside of first and second phase play by just taking our game plan back to basics. On our own plastic pitch back in Cardiff on Friday night it is time for a reaction.